We look forward to welcoming you to our Open Evenings to find out more about life at Peter Symonds College. Students at Peter Symonds College are celebrating a record number of Oxbridge offers, proving once again that the college is the perfect place for ambition. A total of 62 students from 31 different secondary schools have received offers from Oxford and Cambridge. In response to the many requests we receive for new subjects, we are delighted to be able to add the following courses to those detailed in our September 2019 prospectus. The Politics department at Peter Symonds College recently hosted an illuminating talk from Andrew Budd on NATO, detailing the organisation’s current position and the challenges it faces. Peter Symonds College recently hosted a fascinating talk by Astrophysicist Dr Sadie Jones on her experiences in the field of Astrophysics and in particular her research into black holes. A number of students studying Physics at Peter Symonds are celebrating their successes in the British Physics Olympiad competition, achieving outstanding results placing them as some of the top A level physicists in the UK. 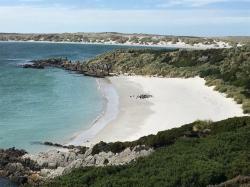 Peter Symonds Principal Sara Russell recently returned from a 16,000 mile round trip to the Falkland Islands to meet with prospective and past students, and the parents of students currently boarding at the College. 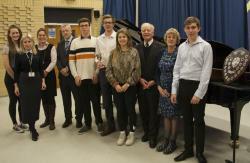 Five students from the Music Department competed in the Outstanding Performances Classical Final of the College’s Young Musician Festival, adjudicated by William Bruce, Head of Strings at Junior Guildhall and Sub-Principal Cellist of the ENO.